Each reflection follows a simple format: an excerpt from one of the gospels, a personal reflection by a teacher, and a short prayer. Teachers can use these reflections and prayers as starting points for their own daily devotion or as resources to use in the few minutes they have to pray during the school day. 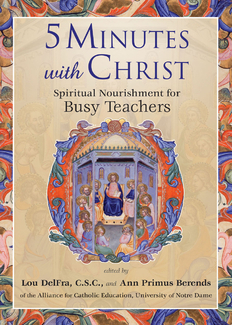 Teachers—particularly those in Catholic schools—are in constant need of spiritual nourishment and inspiration. 5 Minutes with Christ was developed to meet this need. This educator-specific resource is ideal for teacher retreats and spiritual learning communities among faculty members.